Cheese sauce is great to serve with plainly grilled or poached fish - if you poach your fish in milk, then use the milk as part of your sauce - keep the fish warm whilst you finish off. I love cheese sauce. My dad used to make it and we'd have it with gammon steaks, peas, broad beans and new potatoes. It was one of my favourite meals. It's really versatile - this is the sauce you'd use to top lasagne. 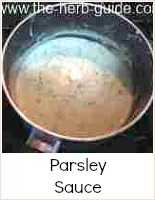 The recipe here is for a basic white sauce, adding cheese - you could make it a parsley sauce by adding a tablespoon of chopped parsley after making the white sauce. 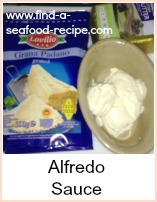 There are three methods of making this sauce - the traditional, the quick and the blender. Melt the butter in a pan - take off the heat and mix in the flour and mustard powder - make it really smooth and lump free or the finished sauce will be lumpy. Return to a low heat and cook for one minute - stirring constantly. Add the milk gradually - stirring all the time with a wooden spoon, making sure that each quantity of milk is incorporated smoothly before adding the next. If you're careful in adding the milk, you won't get any lumps - if you do get lumps, then either whisk with a balloon whisk or sieve the finished sauce. Cook over a very low heat for about 6 minutes. Add the cheese and stir until it's melted into the sauce. Taste and adjust seasoning. You can make this sauce in an 'all in one' quick method. Put all the ingredients except the cheese (they must be cold) into a saucepan and put on a low heat. Using a balloon whisk, constantly whisk the mixture until it begins to thicken - then take a wooden spoon and get right into the edges of the pan. Whisk and stir alternately until the sauce is thick. Then cook about 6 minutes over a low heat, stirring occasionally. Add the cheese and mix in with the spoon until it's melted. Blender Method Put all the ingredients (except the cheese) into the blender and process until smooth - then follow the method as above. This sauce is so versatile. 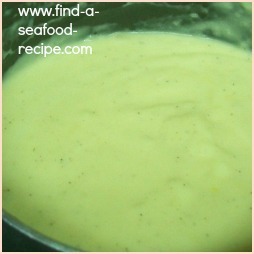 Cheese sauce is delicious with plain cooked fish. 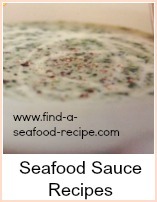 Learn the traditional method as well as an all in one blender method to make this classic sauce.